Present state: The station and platforms survive in good condition and are now in private occupation. Notes: The three stations on the northern section of the line were expected to generate less traffic than those further south, and they were provided with cheaper buildings bought from an outside contractor. 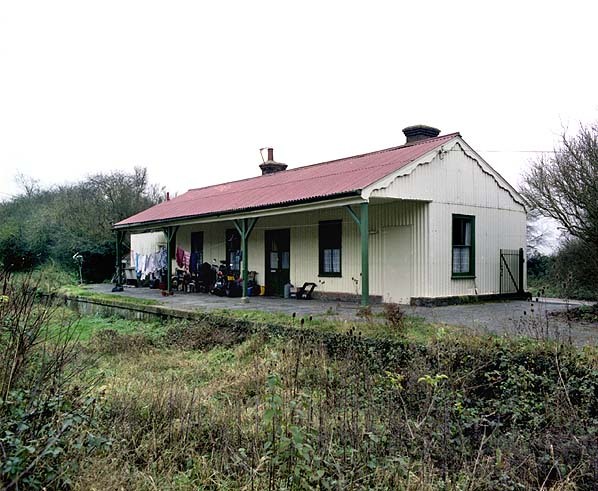 The single-storey building at Bridge was corrugated iron over a timber frame and was similar to some stations on Colonel Stephens' light railways. 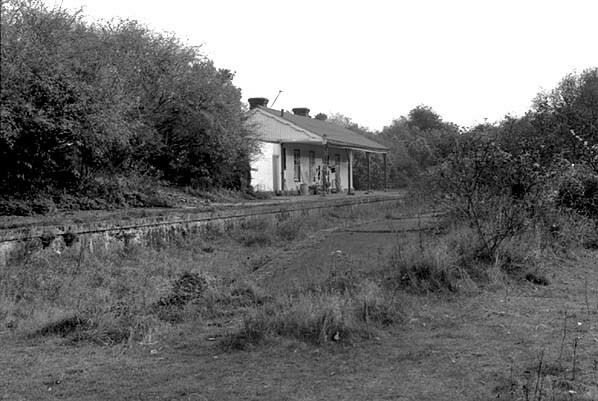 The SER provided a standard waiting shelter and signal box. The station was at the end of a short approach road. Opposite this was a well house which supplied water to the station and railway cottages in Barrackers Road (Later Bridge Road). Bridge was never a busy station and was sited some distance from the village. As the village was on the Dover road, villagers were quick to switch to buses once they arrived rather than face the long slog to the station. 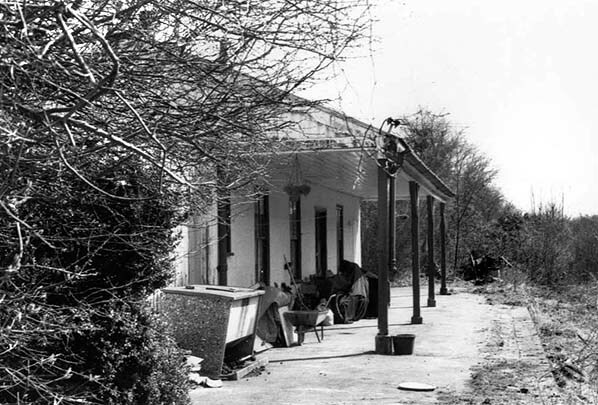 From 1920 passenger receipts dropped dramatically, and it became one of the quietest stations on the line. Goods traffic fared much better, however, with a considerable tonnage of coal and other materials continuing to arrive at the station. 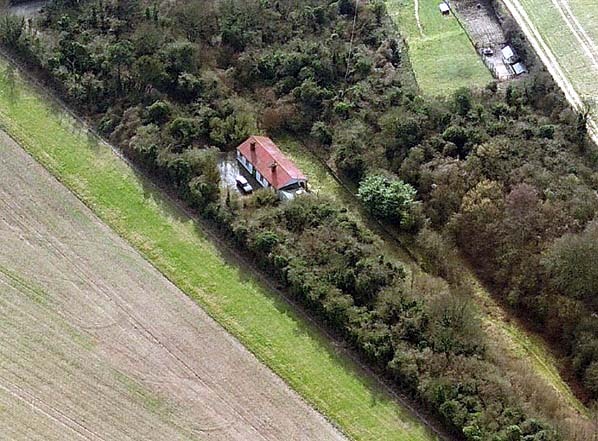 Bridge had a small goods yard which required considerable excavation of the chalk hillside. There were two sidings on the up side of the line requiring trains to reverse into the yard. One siding ran end-on to a small dock behind the north end of the up platform. The other longer siding ran behind the up platform at an angle to the main line. Access to the yard was controlled by a signal box beyond the north end of the down platform. 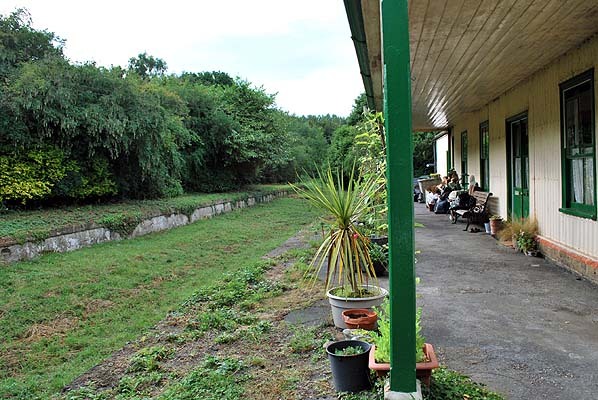 Throughout its life passengers crossed the line using barrow crossings at both ends of the station. In an attempt to keep costs down, the Southern Railway moved the stationmaster at Bridge to another station, and his duties were performed by two porter-signalmen, one on the early turn and the other on the later turn. Their combined duties included stationmaster, ticket collector and clerk. 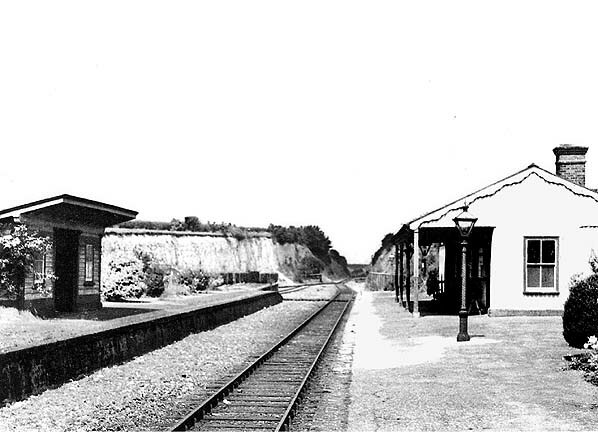 In 1931 the line was singled, and the up platform was taken out of use. 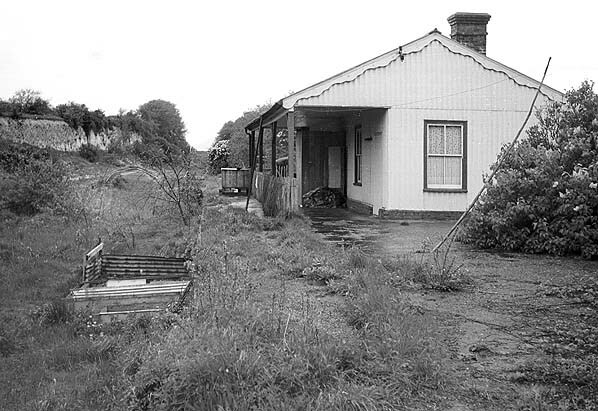 Prior to this South Canterbury station had come under the control of a roving inspector from Canterbury West station, and once the line was singled his duties were extended to Bridge. In the year ending September 1940 only 96 passenger tickets were issued (compared with 1,355 at Bishopsbourne and 321 at South Canterbury) and 153 were collected. 28 parcels were sent and 922 were received. 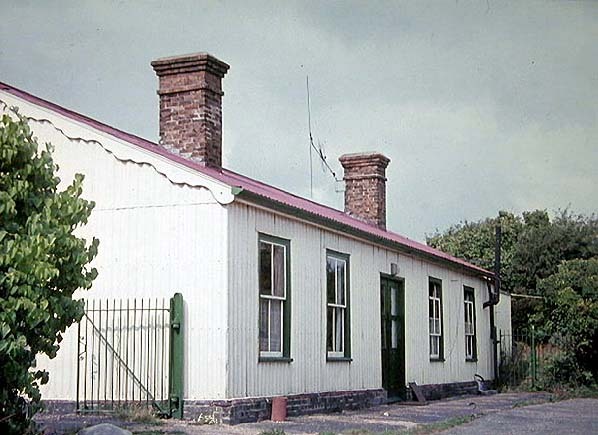 The station still continued to handle a large quantity of coal, receiving 1694 tons (compared to 32 tons at Barham and 5,103 tons at South Canterbury). Other goods traffic was light, with three tons of general merchandise being received and 76 tons dispatched. Livestock traffic was negligible: three horses accounted for the entire year’s traffic. On 25 October 1940 the passenger and goods services through Bridge were suspended when the line came under military control. The station officially closed from 1 December 1940. The goods service was reinstated on 19 February 1945, but it was short-lived as the line closed completely on 1 October 1947. Having obtained their Act in 1853, the Mid-Kent (later East Kent) Railway was soon in financial difficulty, but they managed to secure sufficient finance to continue construction towards Canterbury. The line was again offered to the SER, who again turned it down. This was soon to prove a bad decision as in 1855 the East Kent received parliamentary approval to extend their line south to Dover. Three years later they obtained running powers across the Medway into London. In 1859 what had started as a purely local venture became the London Chatham & Dover Railway, which would soon become a major competitor of the SER. A new halt was opened at Cheriton on 1 May 1908; although this was on the main line it was served only by Elham Valley trains. In 1904 the first steam rail-motors were introduced in Kent in an attempt to attract new traffic to failing branch lines. These consisted of a single, electrically-lit coach and locomotive coupled securely together to act as a single unit. Two of these were allocated to Dover shed and were tried on the Elham Valley line in 1911. They were used during the summer to supplement the existing service between Folkestone and Elham, with four daily services. The rail-motors struggled with the gradients up to the Etchinghill summit and in 1914, having been reduced to two a day, these services were withdrawn completely in 1916. In an attempt to save money, the Southern announced staff reductions and singling of the line. This took a number of years to implement, but in 1931 the line was singled between Harbledown Junction and Lyminge. Through the 1930s, what was one of the most scenic lines in south-east England settled down to a quiet existence, with valley residents and passengers unaware of the upheaval that was to follow at the end of the decade. By 1937 the passenger service had been reduced to five daily trains. In the 1930s the English Channel was defended by short-range artillery left over from the First World War, which would be totally inadequate during the expected invasion. One of Winston Churchill's first tasks as Prime Minister was to search for extra fire-power, with three categories of defence required for the Straits of Dover. Firstly there were long-range guns which could bombard targets in France; secondly there was need for intermediate-range guns capable of hitting enemy shipping in the Channel; and, lastly, there was a requirement for mobile super-heavy rail-mounted guns which could be used against shipping and artillery targets and, if the need arose, be withdrawn to pound the invasion beaches. No photographs are known showing Bridge before the line was singled. 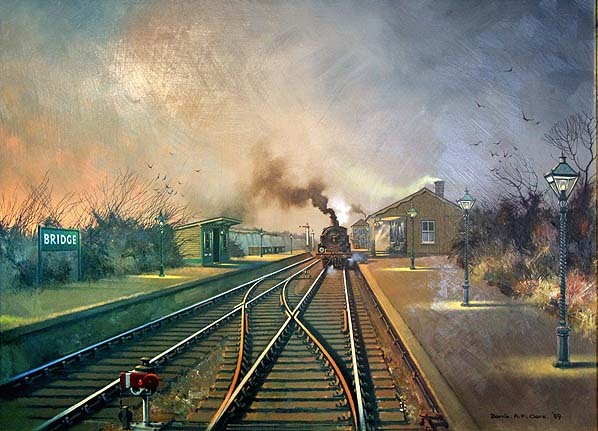 There is, however, this excellent painting which was commissioned by village resident Michael Stewart. The substantial excavation of the chalk hillside required to construct the goods yard and the north end of the station can be seen in the background. Bridge station looking north in May 1959 from a similar viewpoint to the 1936 picture above. Bridge station forecourt in September 1964. Bridge station looking north from the down platform in August 1969. Bridge station looking south from the entrance to the goods yard in November 1975. 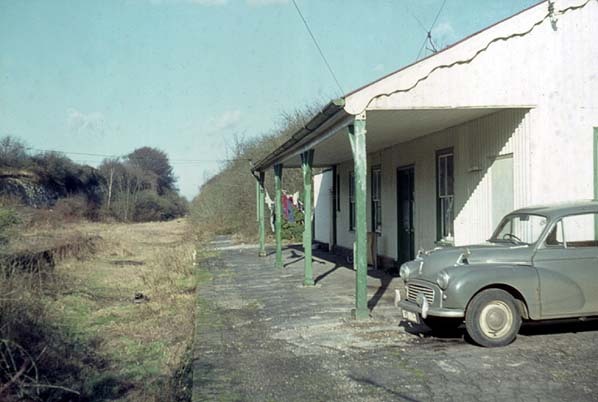 The station building at Bridge in November 1982. Bridge station looking south from the down platform in April 1987. Bridge station looking north from the down platform in June 2009.